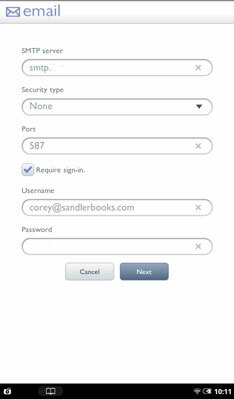 If automatic e-mail setup doesn’t work on your NOOK tablet, you can set up your Email app manually. You have to know the exact name of your provider’s e-mail server for sending and receiving. You should be able to find that by consulting help pages for the provider, by calling their help desk, or by examining the Properties setting on an existing e-mail program on your desktop or laptop computer. In the Apps window, tap Email. You’re taken to the Inbox. If you haven’t visited the Email app yet, you’re taken to a screen so you can set it up. Type the address for your e-mail account. (Optional) Tap the check box for Send E-mail from This Account by Default. The Server Settings screen opens. Choose an account type: POP or IMAP. Enter the name of the POP or IMAP server. For example, it might be something like IMAP.isp_server.com. Some systems have extra security requirements or use a non-standard port (the gateway from your tablet to the Internet). Unless your provider has told you otherwise, leave these settings unchanged. If to the NOOK Tablet connects with the e-mail provider, it shows you another setup screen. Enter the name of the SMTP server, if you’re prompted for it. An example might be something like SMTP.isp_server.com. If all goes well, you see one final page. This is how often the tablet will check for new e-mail. Indicate whether you want to hear a chime when you get new e-mail.